Drive On Moscow - After an absence of many years, large-size, "mini-monsters" will begin making annual reappearances in S&T magazine. This is the first entry in that new series of larger games. Drive on Moscow: Road to Ruin 2, Operation Typhoon, Autumn 1941 (DoM) is a two-player, low-to-intermediate complexity, strategic-level simulation of the final German attempt to capture the capital city of the Soviet Union late in 1941. 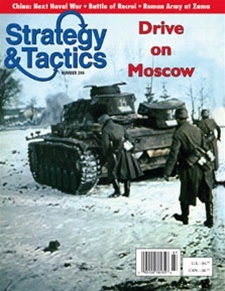 The German player is generally on the offensive, attempting to win the game by isolating or capturing Moscow, or by seizing all the other key cities on map. The Soviet player is primarily on the defensive, but the situation also requires that he prosecute local counterattacks. Play encompasses the period that began with the Germans launching their offensive on 1 October 1941 and ends on 7 December of the same year. By that time it had become clear the invaders had shot their bolt without achieving their objective. Play may end sooner than the historic termination time if either player concedes defeat prior to the official end of a game. Each hexagon on the map represents 7.5 miles (12 kilometers) from side to opposite side. The units of maneuver for both sides are primarily divisions, along with some brigades and one elite super-elite regiment. 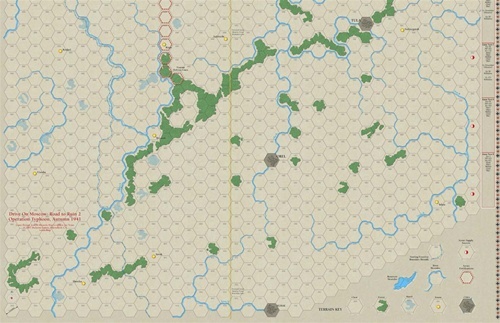 The effects of the general air superiority enjoyed by the Germans throughout much of the campaign are built into the game's movement and combat rules. Each game turn represents a week. The game uses a derivation of the well received system from our boxed game Drive on Stalingrad, 2nd edition. Playing time is about four to six hours. Designed by Joseph Miranda; developed by Ty Bomba.